Figures 11.8(a) and (b) show the equivalent circuit and the circuit symbol, respectively. The device was commercially introduced in 1983, and since then the ratings and characteristics have improved considerably. The IGBT offers significant advantages over BJT and power MOSFET in medium power (a few kW to a several hundred kW) medium frequency say up to 50 kHz power converter applications. Recently, IGBTs are becoming popular for medium power applications, such as dc and ac motor drives, UPS systems, power supplies, etc. Though they are bit costlier as composed to BJT’s , lower gate drive requirement with smaller snubber and lower switching loss make IGBT converter more efficient with smaller size and lower cost. 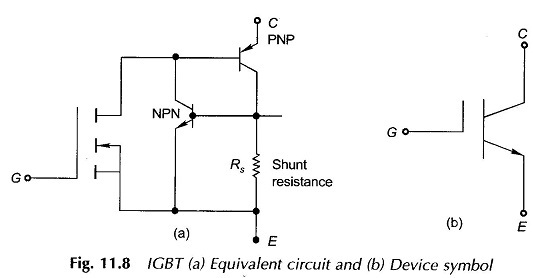 It is expected that IGBTs will eventually replace BJTs in most power applications in near future. The modern IGBT is available with a 1200 V, 400 A power rating.